In VPOP3 a Mail Collector tells VPOP3 how to retrieve messages from the Internet. 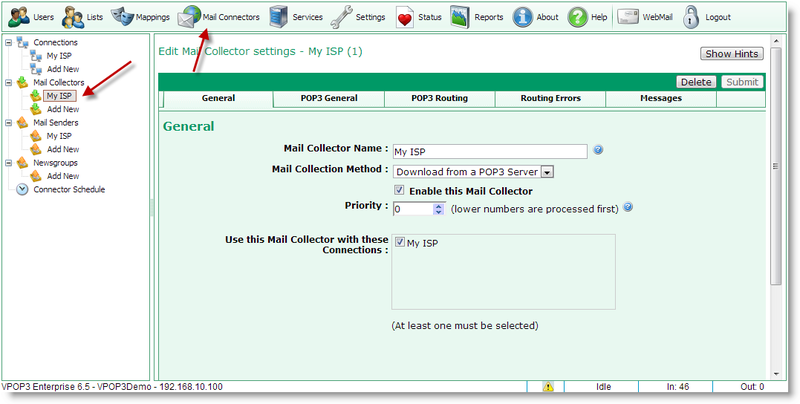 To access the Mail Collector settings, click on the Mail Connectors button on the top of the VPOP3 settings screen, then see the Mail Collectors section of the tree on the left of the screen. To add a new Mail Collector, click on the Add New option under the Mail Collectors section. To edit or view a Mail Collector, select the relevant Mail Collector, then look at the settings in the right-hand side of the screen. To delete a Mail Collector, select the relevant Mail Collector, then click on the Delete button at the top-right of the Mail Collector settings. Note that for a direct incoming SMTP feed, you usually do not need to create a Collector. VPOP3 is always listening for incoming SMTP connections, so an incoming SMTP mail feed should 'just work' if you have your router configured correctly.